Cyril Hitz called my book a love letter to flour, so I thought I should send a Valentine! Pancakes were my first devotion, the first food I made by myself, and the first food I made the lover I married. My mild obsession with pancakes went into overdrive when I learned about fresh flour, and that led to The New Bread Basket. I haven’t forgotten pancakes but sourdough has caught up in its lovely storm. As I dive into sourdough and bread, I’m thrilled to meet so many fellow devotees. I didn’t have partners in my passion for pancakes. Happy eaters, yes, but I was alone in my fascinations and didn’t have the chance to talk shop. There is no shortage of people enchanted by sourdough. 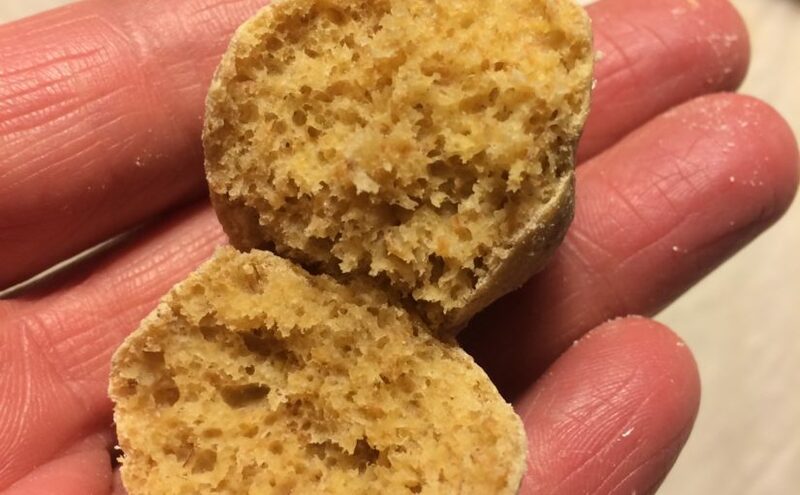 The magic of natural leavening makes you feel connected to something bigger than your life. This liveliness kills the dead metaphor of breaking bread, even though our bread systems are pretty broken. From individuals fearing the daily loaf to actual cells rejecting gluten molecules, to supermarkets creating more “artisan” loaves than the emergency feeding system can absorb – the fractures are many. Food pantries can’t access enough sliced bread because factories have trimmed their waste, and farmers struggle to make their businesses economically viable in a yield-based global commodity market. Yet as many problems are there are with bread, bread makes change from the ground up. I’m exploring these changes more deeply, working on a project to tell the story of Wide Awake Bakery, part of the farmer–baker–miller trio in the first chapter of my book. This year I’m also focused on women in grains. Please look for my profiles on Instagram and Facebook, and audio interviews on my website. In April at the Asheville Bread Festival and with Slow Food NYC, I’ll be leading discussions about women innovating regional grain economies. I probably won’t make any special bread for Thursday, because bread is an everyday love for me. But I am remembering the Valentines I made with my mom. She had a box with paper doilies and Valentines from all eras we could use to make collages. Bread is like that box: a collection of recipes that are postcards from time. The potential of flours, methods and styles of bread – we can pick and choose from all of these elements to connect with traditions and make collages. All of them say I love you. I’ve long been curious about regional grain projects in the middle of the country, so when MOSES, the Midwest Organic and Sustainable Education Service conference included a full day workshop on small grains, I knew I had to go. So I flew to Wisconsin at the end of February. GROWING & MARKETING FOOD-GRADE SMALL GRAINS was a MOSES Organic University course led by farmers. About fifty people were in the room, and about half the them were already doing something with food grade grains — the other half were curious about getting into this emerging market. Other panels and sessions looked at specialty grains, too. 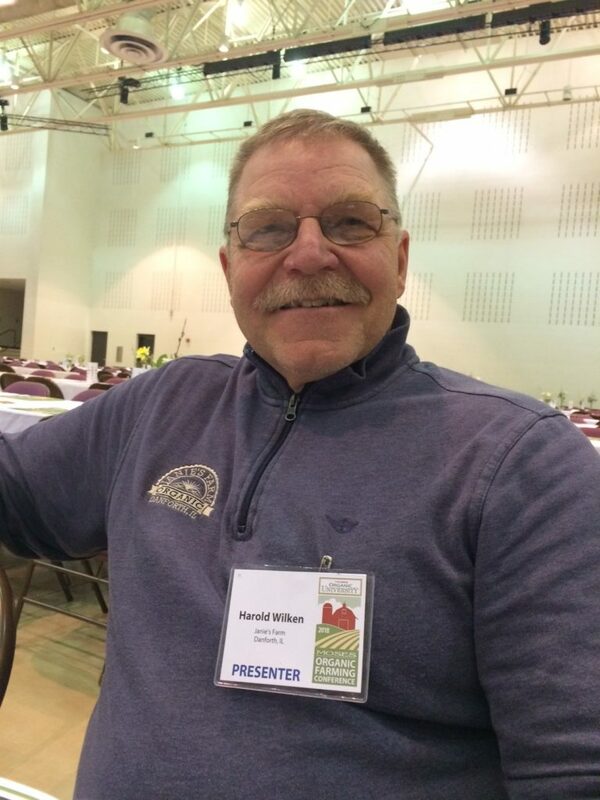 I love Harold Wilken, an Illinois farmer who switched to organics, and started the Mill at Janie’s Farm. This conference was a big event. Lots of vendors lined the halls of the convention center, and, looking down from the bleachers, I saw a little city of rural people, strolling past tables, or standing still, to talk about products and services: soil amendments, seeds, tillage equipment. A low-bellied din hovered over the activity like the buzz of a beehive. I recognized some vendors & groups: Johnny’s Seeds, Practical Farmers of Iowa, and the Young Farmers Coalition. But mostly, things were unfamiliar. I am always surprised by how little I know about farming. This is why I feel compelled to write about agriculture. We are so divided from our food, and how it gets to us. I want to change that, and that means I have to keep facing my ignorance. The blindspot I saw this time was the dominance of corn/soy inside organics. I didn’t realize that organics mirrored conventional farming, but in both farming styles, corn and soy for commodity markets are the top crops. Which just gives me another reason to push for mills and malthouses — so growers can step out of commodity price strictures, where they have no say in their earnings. Easy enough for me to say, but it takes a lot more than one flour fan to convince growers to shift gears. But this flour fan had the ears of a crowd in Minneapolis at the Food Building. This is where Baker’s Field Flour and Bread lives, and where I led a talk, called Farmer, Miller, Baker, Maker: Why Modern Grain Matters. The panel included miller/baker Steve Horton, Jeff Casper of Dumplings and Strand, Ben Penner of Ben Penner Farms, and Luke Peterson of Peterson Farms. I tried to show how these grain partnerships were unusual, and why they deserved support. Farmers Ben and Luke did a great job of describing their families’ decisions to do something different with grains. Theresa J. Beckhusen wrote a good story about the event in City Pages, and if you want to hear a recording, please head here. 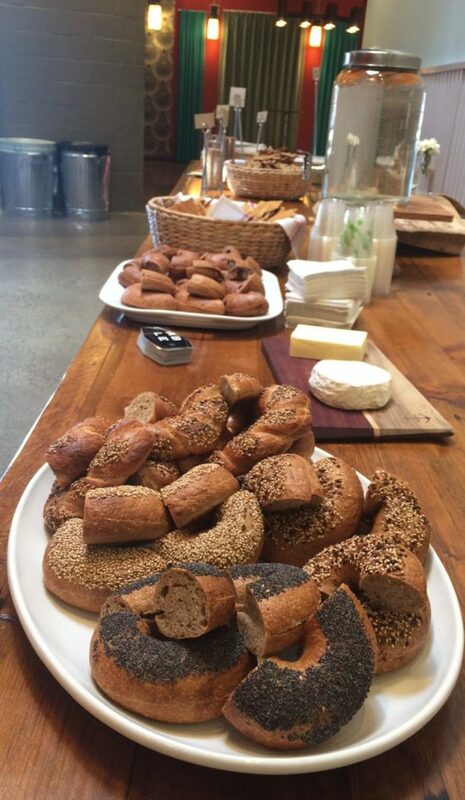 These sourdough bagels were fantastic! And I ate them standing next to the farmer who grew the wheat, Ben Penner, and his family. Pretty special. A woman in the audience at the Food Building asked what people could ask their senators for as the Farm Bill comes up for review. I wasn’t quick enough to say SUPPORT CROP ROTATIONS, but I did say people should ask their bakers to use local flour, even for one type of cookie, or one loaf of bread. I’m rabid to do more talks like this — to help introduce people to the pioneers who are helping us get new grains. Each new mill and malt house needs dedicated consumers. If you’d like me to do a talk near you, please let me know. I am home from my latest expedition, which began in Chicago, on a panel at The Good Food Festival. “When I opened my bakery four years ago, I thought it would be easy to get local flour,” said Ellen Levine. The owner of Hewn had trained as a pastry chef in Seattle, and thought that moving home to the breadbasket would give her access to my favorite food. However, like Randy George of Red Hen Baking in Vermont, patience and inquisition have been the keys to helping develop regional supply. Erin Meyer and I in front of Hewn, in Evanston. Visiting her bakery and meeting her business partner Julie and some of their employees was a treat. I couldn’t have dreamt up a better origin story: this iteration of the bakery began when Ellen’s very small bicycle delivery CSB caught Julie’s attention. Once Julie had the bread, she began a journey to help get this bread to more people. Now, Hewn is waiting for Janie’s Farm to get their milling operation online so they can use more regional flour. Next I went to the Mill City Museum, which is made from the ruins of Pillsbury’s Washburn A mill. As I was researching my book I read about Minnesota’s history with milling and wheat. This is where spring bread wheat really took root, and so did American roller milling. Maybe this was Ground Zero for the disappearance of wheat, flour and bread from daily life? I don’t think there’s really one Ground Zero for the sea changes we’ve seen in grains over the last 200 years, but significant changes began to happen in Minneapolis, and I was glad to visit the remnants of the mill. The reason for this trip was a residency at the McCarthy Center for Public Policy and Civic Engagement at St. John’s University. I spent three days there and at the College of St. Benedict’s, talking my heart out about regional grains and how to change the food system. Professor Matt Lindstrom, Director of the McCarthy Center invited me, and hosted the centerpiece event, a conversation with Chef Paul Berglund, the James Beard award-winning chef from The Bachelor Farmer. We talked about the challenges of using food that links more directly to the land than products from the dominant production system. Matt Lindstrom, Paul Berglund and I at St. John’s Pottery. The talk was held at St. John’s Pottery, which operates in a tradition that glues the pottery to the place. Now I can drink tea from the mug that Richard Bresnahan gave me, and reflect on a subject that’s been itching me this year. As people we create containers for each other. We open and shut doors to each other and experiences. This notion came to me because in January and February, my city lost a few residents. Dean Leith founder of Capital Roots, and Mary Jane Smith, who founded Unity House, and my neighbor Chico Christopher and my aunt Mary Ellen Halloran all passed away. My cousin John and Steve’s remembrances of their mother helped me see a lesson in these exits. Do the work, was the theme that John took from his mother’s life, using the fact that she made bread for their sandwiches all through school as a suggestion that we should just do the work, not fuss about presidential dramas or other unsolvable woes. Steve noted that his mother, an elementary school teacher didn’t try to change people. She loved her students, and that changed them. Do the work and love each other — these practical injunctions resonate for me as I consider the structures that the other people I mentioned created. My neighbor Chico was an architect and served on the board at Capital Roots, which grew from Dean Leith and Garden Way’s initial community garden into a multi-pronged food access and urban greening agency. Mary Jane Smith was an architect of the multi-pronged human services agency that houses the community meals and food pantry programs where I work. At St. John’s and St. Ben’s, I realized that my grains storytelling began when Matt and Amy Lindstrom built another container, the Troy Waterfront Farmers Market with other people in my city. I applied for the job as market manager because I was tired of writing query letters for jobs that I never got. I had no clue that my writing would find a new imperative. Working for the farmers I saw I needed to make visible the work that we eaters take for granted. And that awareness is something I explore in another container – an essay in the book Letters to a Young Farmer. Stone Barns Center for Food and Agriculture invited me to contribute this piece to that book, which is part of their general effort to create change and opportunities in farming. My trip to the Midwest held many more people that I want to tell you about, but I’ve been talking long enough this morning, so I will tell you more another time. Lauren and Ali, who are researching the nutritional value of Emmer. I dub them, with affection, The Emmer Sisters. I can’t believe how much of it has slipped under us already this year. It feels like I was just packing for the Cascadia Grains conference, yet since then, I’ve been enough places to break a suitcase. Maybe this is why my suitcase broke! I wanted to write about each one and tell you about the grains pioneers I met, but as soon as I get home I’m back to work at Unity House. I am grateful that my job is flexible enough to let me pursue so many opportunities. Everywhere I go, I try to get a taste of the innovations in emergency feeding programs like the ones I help run. Last week in New York, I visited Holy Apostles Soup Kitchen, which serves 1000 lunches a day. 50 different volunteers make this happen, plus Chef Felipe Saint-Martin and a small but steady kitchen support staff. One thing I love about this place is that they use whole grains and lots of fresh vegetables. Dessert is always a piece of fruit. Offering these nutrient dense staples is tough in an emergency food environment. I was really inspired by their example, and I look forward to visiting with them again, maybe for their fundraiser in May, Farm to Tray. 1000 meals a day calls for some goofing off. At work, we are serving lots of vegetables these days. Pickled beets, carrot salad with turnips, and green salad with oranges and grapes. Blueberries are pouring in, free from the USDA commodities program, and somehow, we are getting zillions of grapes through the food bank. The flow of food always intrigues me, but the routes to grains are the ones I want to understand most. 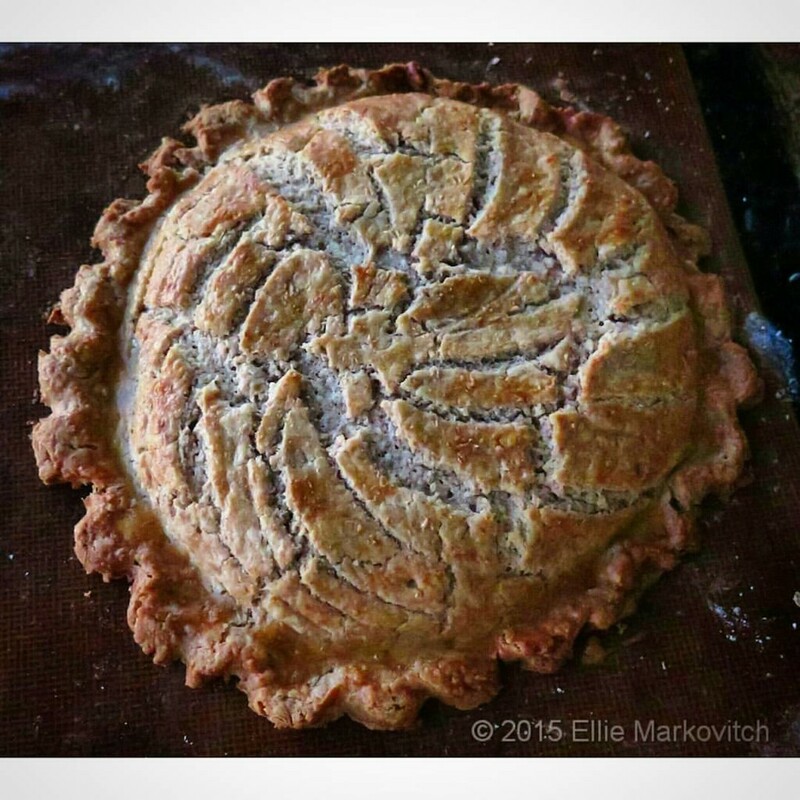 Beautiful soft white pastry wheat. Made great pancakes! And some killer biscuits, too. Tom Edwards is doing something extraordinary with Louismill & MozzaPi in Louisville, Kentucky. I am so grateful I had four whole hours to do a presentation with him before the IACP conference. Tom served grits and beautiful breads for breakfast, and talked about what he was doing with the mill – creating a new model that prioritizes farmers and the grains themselves. He talked about the conversation he had with the Mennonite farmers who are growing his corn, and paying them twice the commodity rate so that they could stop working off-farm. This is what fuels my fire: the decision to create new relationships between staple crops, from field to mill and mill to me. Thank you Tom, for making such a fantastic place. That day really nourished me. Now I am home for a minute, and the snow is about to pile on us in the Northeast. I’ll be walking to work and making breakfast for lunch for whoever braves the blizzard. I hope you are tucked in snug, like blueberries under a crust – be sure to get or bake some pie for Pi Day, okay? I miss my friend Ellie so she and I are stretching across the clouds between us through the best glue we know — pictures, food and words. Instagram has been a penpal service covering the distance between Troy, New York and Brazil, where she now lives. In salute to the new year, we’re getting organized about connecting with each other through social media. This isn’t a private journey — please tag along. 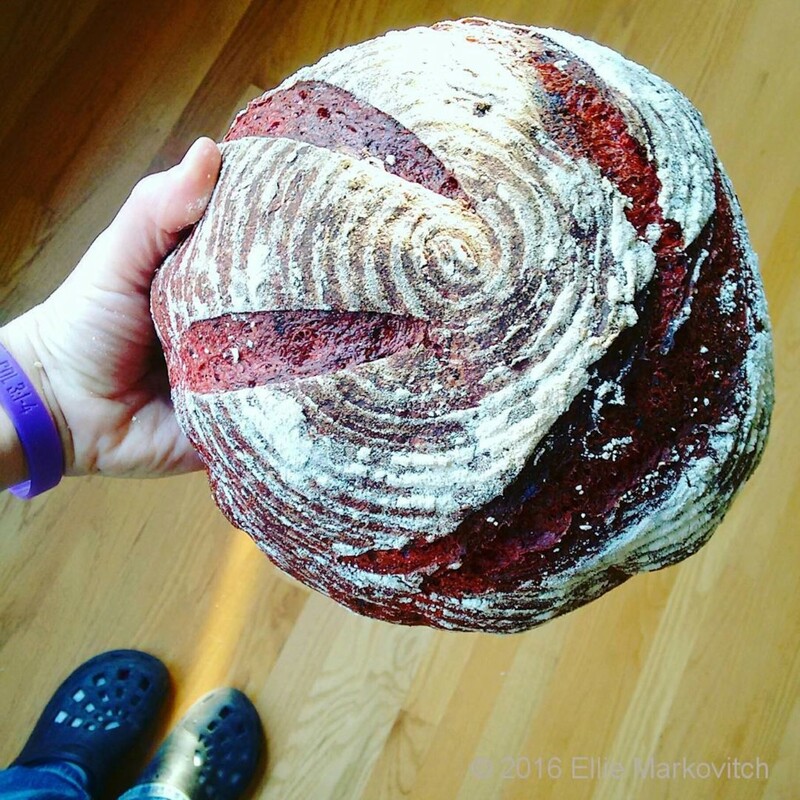 Ellie Markovitch makes me want to eat vegetables, like this beet and rye bread. Do you want to bake your own bread? Cook more at home? Set up regular times for reading? Cultivating habits is easier with friends, so we invite you to join our challenge. Decide what goal you want to focus on, state it in your first post, and show us again and again how you #CreatePatterns in your life. Show us your flour. Snap a shot of the page you’re reading. Show us your ingredients. People you are sharing meals with. The rules? None. The suggestions: set aside 20 minutes a day. Choose one goal. Switch focus after a week, a month, a year – whenever you want to guide your attentions to another area. Ellie’s King’s Cake made with rye. This idea comes from us, two friends who want to bridge the gap between Brazil and upstate New York, where they used to inspire each other in cooking, writing and photography projects. Photojournalist @Ellie Markovitch (storycooking.com) is pushing the reset button, returning to her home country, starting a kitchen from scratch in Rio de Janeiro. On Instagram, I am @Amy.Halloran, @flourambassador (amyhalloran.net) and I want to set a tone for growth, and develop a social structure to support it past the first weeks of the new year. Christmas Eve, my parents made lots of magic after we went to bed. The most wonderful thing was the dolls’ breakfast my mom set up. She took our dolls and stuffed animals and set them up at a table. In the morning my sisters and I were completely enchanted. The dolls had a tea party, and tiny presents. This was only the first of delights. Next came the stockings, and then the tree. Sometimes, in between, there was a treasure hunt, with clues in the stockings guiding us around the house to find larger presents that didn’t fit under the tree. I don’t know if I ever managed to make a setup for my kids, though this was the kind of magic I wanted to repeat. I marvel at how my mom managed to make such charms for us, her care hidden from us while we slept. 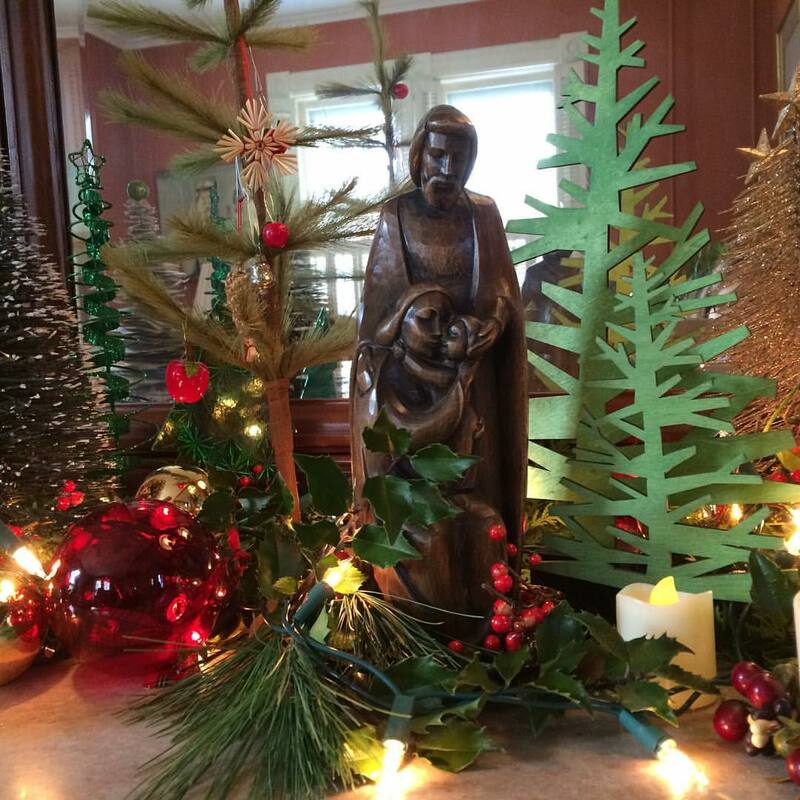 One of my mom’s Christmas setups. My mother made us feel that special was normal. Not everybody gets to have that luxury. I get to see this in my day job, running a community meals program and food pantry. This work seems very different from my writing about regional grain projects, but the jobs share a common thread. I am making people visible. Feeding people is not just physical. In the best scenarios, feeding is a manifestation of care, an extension of concern that should answer more than hunger. In the dining room and in the pantry, I hope we make people feel seen and acknowledged. That all their appetites – for work, emotional safety, health, and interpersonal connections – are valuable and that they as people are worthy and deserving. Writing is a way to make people visible, too. Stories are bridges, helping us cross into other lives. I get to connect readers to the work that goes into bread, from field to loaf. Even though I was an avid baker most of my life, it took me forty years to begin to wonder about flour. My book was a way to show my wonder, and introduce some of the pioneers working in grains. I want to keep showing the labors tucked inside each miraculous loaf of bread, behind every glass of beer. I’m thrilled that I got another chance to tell the story of Skowhegan, Maine at the New Food Economy. 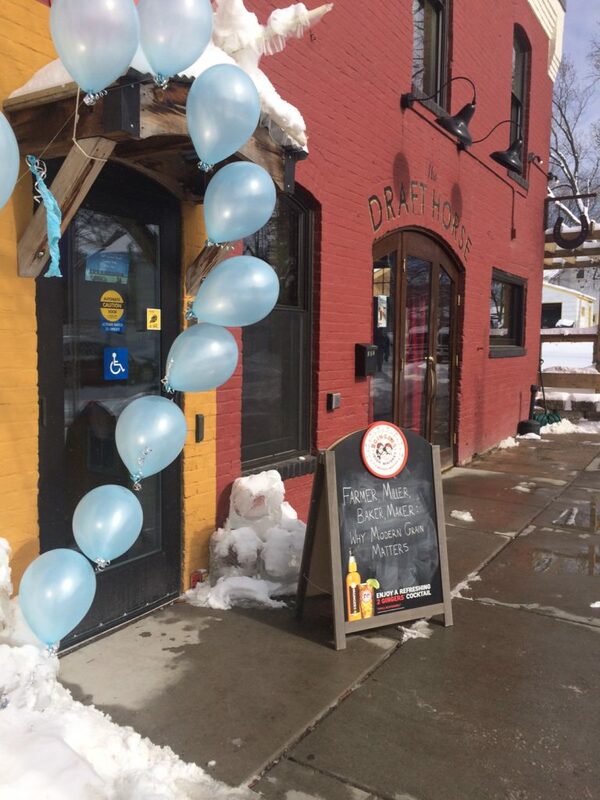 Bread is medicine for Skowhegan, and for lots of other places where people want to find new ways to connect with each other over food. This concept isn’t new, but adding milling and local grain farming into the mix is. Baking has long been a conduit for stitching people together, from swapping sweets at the holidays, to bake sale fundraisers, to much grander projects, like a bakery that’s in the works in Lebanon. The Sadalsuud Foundation is launching a bakery to help create a bridge between residents and Syrian refugees. 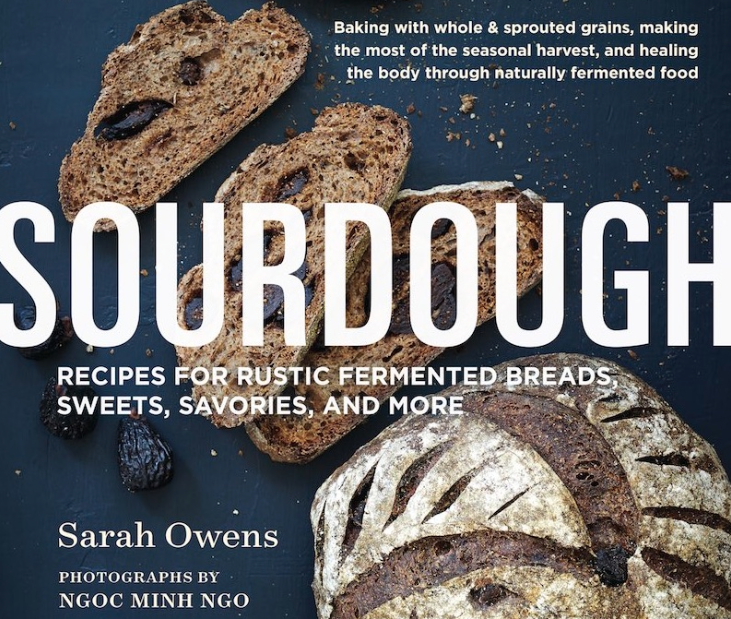 Sarah Owens, author of the beautiful and useful Sourdough Cookbook is soon leaving to set up the bakery and train bakers. She’s written about the project on her blog. This is bread building community, making us visible, and our work visible, to each other. I started the Flour Ambassador campaign with this kind of visibility in mind: to shine a light on great grains and regional mills, and raise awareness of all the people whose work goes into making bread. This bakery project in Lebanon is letting flour and bread bridge cultures, helping people see each other in the work of making our daily bread. 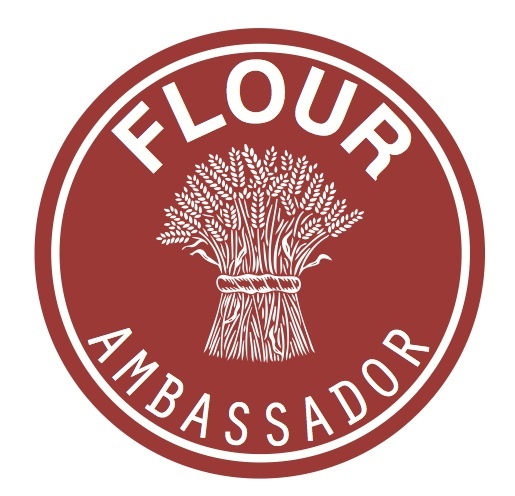 I have embroidered badges with the Flour Ambassador logo. If you’d like one, please donate to the Sadalsuud Foundation, and then send me an email note with your physical address, and I’ll send you a badge, or two or three. Here’s to bread, and all the hidden work that makes our days special and normal. Thanks mom, for showing me that life can be both pedestrian and spectacular. What a wonderful lesson. Shortbreads are a great way to taste fresh whole grain flours. As Nan Kohler of Grist & Toll says, the flavors seem to amplify each other – the butter gets butterier, the salt tastes saltier, and good flour tastes fantastic in a shortbread. Purple Egyptian barley shortbreads make a house I want to live inside. Holiday baking makes me want to go fancy, and get festive with the ingredients & shapes. But shortbreads do best as themselves. Salt, butter, flour – maybe some sugar, maybe not. There is no need to dress these up, or make pretty shapes. Just cut a bunch of tiny squares and bake and you have done your best by the flour. My favorite shortbreads I’ve made this year are from purple Egyptian barley grown on the Palouse Colony Farm. I could not get over the taste – this barley has a lot of flavor. It is not commonly found, so it may seem I’m teasing you by mentioning it. Sorry about that: I’m just in love with it. 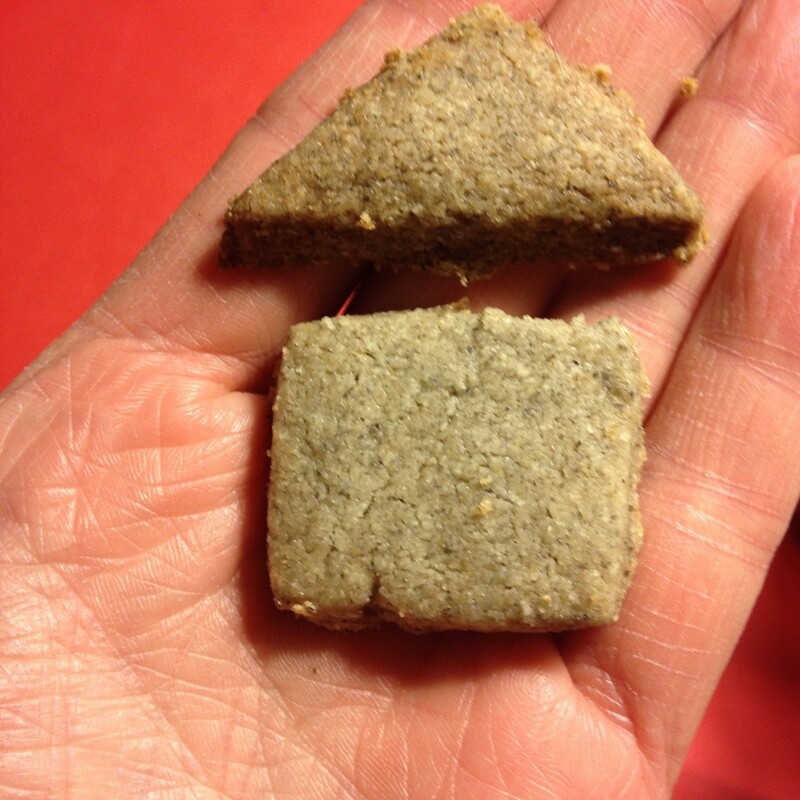 I am also in love with spelt shortbreads, or rye-spelt, or 100% whole wheats. Sonora and other white wheats are great on their own, and oat flour is a great addition. When I used the purple Egyptian, I only used half barley because I didn’t have much of it. I also thought the cookie could be too crumbly if it were all barley – rye, oats and barley I think will do best combined with some wheat. Bear in mind that if you use heritage flours, they are thirstier than flours you get on the supermarket shelf. What this means for cookies is that you might need less flour to get the dough you want. Start with 10 ounces and see how close to a pie crust style dough you get. If the dough isn’t stiff enough, add more. I’d start with 11 ounces for supermarket flours and modern varieties of wheat that are stone ground. Mix flour, sugar and salt in the bowl of a stand mixer. Cut butter into ½ inch squares, and using the paddle, mix into the dry ingredients. Start with 10 ounces and see what you’ve got. The dough should be pretty stiff, but come together in a ball. Think pastry crust, more than cookie dough. You will likely need to add more flour to get to the right consistency. If you add too much flour — meaning that ball you made crumbles, just add a tablespoon of water or rose water, and add another if the dough is still crumbly. Put on a floured surface, and pat into a rectangle about an inch thick. Roll about ¼ inch thick, cut into 1 inch squares, and bake about 12-15 minutes on unbuttered cookie sheets. You might want to roll and cut on parchment to make the transfer simpler. I use a ruler and a knife to cut the cookie dough. Tip: don’t try to make a shortbread into something else. Sugar cookie and gingerbread doughs are sturdier than this one, and the big, cookie cutter shapes you can make with gingerbread or sugar cookie dough will break with this one. Trust me.